Posted on January 1, 2016 by gayle. This entry was posted in General, Uncategorized and tagged first book 2016, happy new year. Bookmark the permalink. I haven’t heard any buzz about this one yet – it’s not out til Feb – but I’m really liking it. A sad book? Awww! I’ll have to check it out on Goodreads! Yes, though now it’s also getting to be a bit of a thriller. I really like it! This book is new to me though I have heard of the author. It’s definitely intriguing that it’s so sad but impossible to put down. Hope it continues to stay a page turner! Thanks, Katherine! Happy new year to you! I have a hard time with sad books. It depends on how they are written and what the topic is about though. From your comments this one sounds good. That’s a great pic of you! Happy New Year. Glad you’re enjoying your read–even if it is sad. I have a hard time with sad books but if they’re done well, they’re definitely worth it. Thanks! This one has a lot of painful parts but it’s also very suspenseful. I’m anxious to read that one too. Happy New Year! Thanks, Kathy – same to you!! Hau’oli Makahiki Hou. This sounds like real life choices. Enjoy your read. Ooh, I’ll have to keep an eye out for this one when it is released! I’m usually up for a sad book! I haven’t heard of this title, but I’m intrigued. I hope you continue to enjoy, despite the sadness. Thanks! 100pp left and I am still enjoying it. It’s not as sad at this point. After reading the blurb, I can see how it would be sad, but at the same time hard to put down. Glad you’re enjoying your first read of 2016. Happy New Year! Thanks – same to you!! Happy New Year. Hmm you’ve intrigued me to go read a little more about this book, not sure I am that good with sad/difficult but can’t put down balances it a good deal. The sad parts are balanced by the suspenseful stuff. This is my first year participating in the first book of the year event and I love seeing what everyone is reading! I can’t say I have read any of these author’s books before. I hope you enjoy! Happy New Year! Sounds like a good choice. Happy New Year! Thanks. I am really liking it, though I know that something bad is about to happen. I love this author so this book will go on my TBR list. Happy New Year. I don’t think I could start my year with a sad book. But then again I have no idea if the book I chose will be sad or not. Now I’m thinking I should have chosen a romance 🙂 Happy reading! Looks like you picked a good one to start the year with! 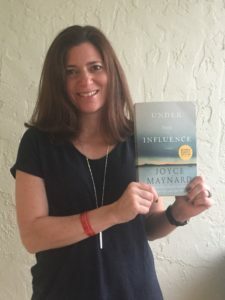 I think I’ve read all of Joyce Maynard’s novels and one memoir. Love her books usually! I’ve been out of the loop in the book world lately, so am adding this to my TBR list now. Happy New Year! I know this author, but not this book. Not sure I would like sad, but since you can’t put it down, it must be good and good choice.